…specifically, the 37-yard touchdown pass from Drew Brees to Alvin Kamara as the Saints played a 4th-and-7 in the fourth quarter of Sunday’s 48-7 blowout. At the time, the Saints were up 38-7 on Philadelphia, and it was one of those situations where head coach Sean Payton has what appeared to be three more or less equal options. He could send Will Lutz out for a 54-yard field goal, which would have been within Lutz’ range, to make the score 41-7 with basically the entire fourth quarter left in the game. He could send Thomas Morstead out to punt, with a decent likelihood if pinning Philadelphia inside their own 10, when the Eagles’ offense was more or less incapable of moving the ball. Or he could go for a first down. Payton decided to leave his offense on the field, signaling that it wasn’t quite garbage time despite the 31-point lead. And the play he called resulted in one of the more gorgeous touchdowns you’ll ever see. Was that throw not an absolute masterpiece by Brees, who has to be cementing his position as the runaway favorite for MVP of the NFL this year? It isn’t possible to place a football better than he did on that play – which was of a piece with Brees’ performance all game long. But here’s what makes that play particularly enjoyable – Brees and Kamara’s touchdown collaboration came at the expense of Eagles’ safety Malcolm Jenkins, a former Saint (it was Jenkins who got burned by Vernon Davis in that infamous playoff loss to San Francisco) who this side of Colin Kaepernick and Eric Reid might be the most irritating of the NFL’s social justice warriors. Jenkins isn’t a bad player, but he’s nothing if not obnoxious in his abuse of his athletic talents to promote the divisive Black Lives Matter political activism. The New Orleans Saints had their way with the Philadelphia Eagles on Sunday to the tune of a 48-7 victory (see Roob’s observations). 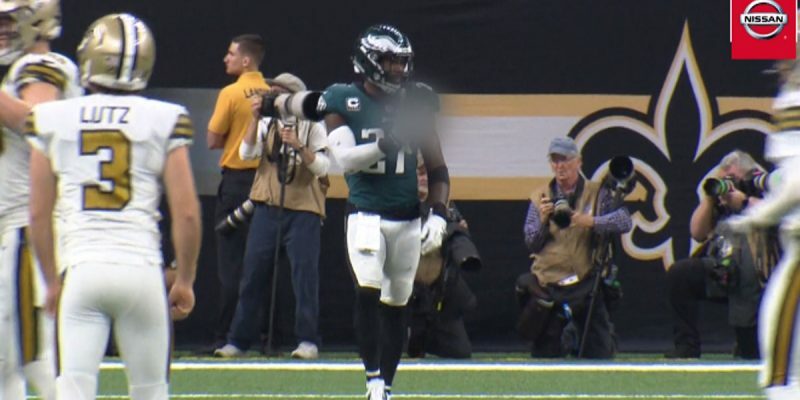 The frustration clearly boiled over for the Eagles players, including safety Malcolm Jenkins, who was caught on camera giving the finger in the direction of his former head coach Sean Payton. Jenkins was beaten badly on a 4th-and-7 play when New Orleans was up big in the second half. Jenkins was caught one-on-one with Saints running back Alvin Kamara, who beat him for a 37-yard touchdown. Payton also indicated there were no hard feelings from Jenkins’ middle-finger salute – because after all, why would he? He just inflicted a 41-point evisceration of Jenkins’ team, including a showcase play which came at Jenkins’ personal expense. A middle-finger salute in response is cause for hilarity, not reprisals. While Kamara’s touchdown burning Jenkins to a crisp might have been the most entertaining of Sunday’s developments for the Saints, the most significant was the 10-catch, 157-yard performance by wide receiver Tre’Quan Smith, who might have had his breakout game as an NFL star. Smith’s potential hasn’t been in doubt since his arrival in New Orleans, but prior to the Eagles game it was a matter of dispute whether that potential would translate into concrete results this year. Smith had only 12 catches for 214 yards, albeit with three touchdowns, in the first nine games of the season – but on Sunday he served notice that he’s a legitimate second option behind Michael Thomas out wide who can make the tough catch, beat a defense deep and cut up a secondary in the open field with the ball in his hands. That’s an issue the Saints have been looking to resolve since an injury to Ted Ginn put the veteran receiver on injured reserve, with signings of Dez Bryant and Brandon Marshall intended to address it. With Marshall figuring to come online in the next week or so, Smith’s emergence and the less-stark coming-out of rookie free agent Keith Kirkwood, who made a couple of nice catches against the Eagles, it appears as though there is no real limit to the Saints’ arsenal of weapons in the passing game. And of course, with Kamara and Mark Ingram behind perhaps the best offensive line in the NFL and a defense which seems to finally be finding its footing as the season goes along, that means there’s no limit to what the Saints – who at the moment hold the advantage in the race for home field advantage throughout the NFC playoffs – can do to opponents this year. Thursday is the Saintsgiving matchup with the 4-6 Atlanta Falcons, who lost to Dallas 22-19 in Atlanta Sunday, coming to town. Kickoff is set for 7:20 p.m. central time.